The IBM 4039 LaserPrinter features the ability to add duplex capability, and broader connectivity than the 4029 series of IBM LaserPrinters. A PostScript** Level 1 interpreter with 39 Type 1 outline fonts, PCL5, and true 600 x 600 dots per inch (DPI) meet user needs for broader functions as standard features on a compact desktop LaserPrinter. The 4039 LaserPrinter is designed, through integrated network adapter options, for attachment to Token-Ring and Ethernet local area networks, and networks with the Appletalk Network Interface. In addition, direct attachment, via parallel or serial, can be made to IBM Personal Computers, RISC System/6000 and Apple Workstations. The 4039 does not support PPDS. The IBM 4039 LaserPrinter 12L plus has several enhancements at no additional cost. These enhancements provide the customer with the latest level support for PCL5 and PostScript 2 emulation. A Proprinter emulation program is also provided, enabling the 4039-12L plus to generally support software applications that operate with the IBM Personal Printer Data Stream (PPDS). A new bi-directional set-up utility, MarkVision**, allows the customer to set-up and monitor the printer from a Windows** workstation in a Novell** NetWare** environment. An expanded memory is offered through a new 4 Mb flash memory option. No change is made to the machine type and model. The manufacturing part number, however, has been changed. An upgade kit for the existing 4039-12L is offered. The upgrade kit allows customers with an existing 4039-12L to include the software enhancements and bring their printer to the plus level. Duplex capability that may be added as necessary. 39 Type 1 fonts, 36 CG fonts, 10 TrueType fonts, and 2 bitmapped fonts. 1 Mb, 2 Mb, and 4 Mb Flash memory options. Excellent paper handling and paper handling options. The IBM 4039 12L plus will provide customers with an affordable solution for printing professional looking text and graphics using the industry standard PostScript Level 2 emulation and enhanced PCL5 emulation. The many resident scalable fonts and optional font capability with expanded flash memory will enhance the appearance of the user's documents. New printer drivers and an enhanced Printer Toolkit make downloading to flash memory easier than ever. The IBM 4039 12L plus is designed for fast, easy setup. The printer comes pre-assembled with print cartridge and paper tray already installed. A complete startup kit contains easy-to-read instruction manuals and information necessary to be up and running quickly. A Printer Setup Utility and drivers for several popular software applications are also included. A 4 x 20 LCD operator panel display uses simple terminology to lead the user through the available menus. The flash memory and disk options allow the user to download fonts that remain in the printer as long as the option is installed. The expandable memory (up to 16 Mb) can increase productivity with improved performance achieved by facilitating scalable font cache, images, and forms stored in the printer memory. Automatic Emulation and Mode switching is standard in the IBM LaserPrinter 4039 12L plus Printer. The IBM LaserPrinter 4039 12L plus features speed, up to 12 pages-per-minute for dramatically improved throughput, the ability to add duplex capability, and broader connectivity than the 4029 series of IBM LaserPrinters. A PostScript** Level 2 interpreter with 39 Type 1 outline fonts, 4 Mb of memory, PCL5, and true 600 x 600 dots per inch (DPI) meet user needs for broader functions as standard features on a compact desktop LaserPrinter. The 4039 12L plus is designed, through integrated network adapter options, for attachment to Token-Ring and Ethernet** local area networks, and networks with the Appletalk** Network Interface. In addition, direct attachment, via parallel or serial, can be made to IBM Personal Computers, RISC System/6000s and Apple Workstations. The 4039 12L plus offers Print Quality Enhancement Technology (PQET) for extremely sharp text and graphics and can print on a variety of paper types and sizes as well as on transparencies and labels. A 500 sheet (20 lb) automatic sheet feeder, a 500 sheet output tray with a full tray sensor, and a manual feed tray are standard. A parallel cable is included with each printer shipped from IBM. The printer comes standard from the factory with the following features installed: 4 MByte of printer memory, PostScript Level 2 interpreter with 39 Fonts and enhanced PCL5 Printer Emulation for 100% Plug and Play with HPIIIsi, auto Emulation switching, and Integrated Network Slots for Network Connectivity. A 12 PPM laser printer with a 16.0 MHz AMD 29200 microprocessor, 1 font card slot, 2 emulation option connectors, auto-paper size sensing, 500-sheet Input standard, 600 DPI resolution PostScript Level 1 language capability, envelope enhance, PQET hardware, 500 sheet output tray with output full sensing. Face-up or collated output is provided. Standard outline fonts are Courier, Times Roman**, Helvetica**, and Helvetica Narrow, ITC Avant Garde Gothic, ITC Bookman, New Century Schoolbook, Palatino**, and ITC Zapf, print quality enhancement technology (PQET), a user friendly 4x20 character LCD operator panel, multiple resolution print quality capabilities, 300 DPI and 600 DPI standard and versatile paper handling options are some of the basic functions of the IBM LaserPrinter 4039 12L plus. The IBM LaserPrinter 4039 Series 12L plus printer is an additional product to the IBM 4029 LaserPrinter Series family. The IBM LaserPrinter 4029 12L plus is a compact desk top letter quality printer which use non-impact laser electrophotographic printing process. As was IBM 4029 Laser Printer, the IBM LaserPrinter 4039 Series is designed for attachment to small business and personal computer systems. They are capable of printing on a variety of paper types and sizes, transparencies, and other supplies designed for use with laser printers. These supplies can be automatically fed from a built in 500 sheet paper tray or manually fed from the rear of the printer. All models provide all of the standard features of the IBM 4039. Additionally, the following enhancements are included as standard features on all models except where noted. Note: 1) The printer is at maximum height when it is equipped with the optional 500-Sheet Second Drawer. 2) The printer is at maximum depth, when it has both the front exit tray and the optional Envelope+ Feeder installed. 3) Weight without paper. * Operating Clearance: The printer requires 152 mm (6.0 inches) on all four sides and 305 mm (12.0 inches on top for proper operation. Recycled paper less then 80 g/sqm is not recommended for this printer. Some reduction in print quality may occur at the extremes of this operating environment. The IBM LaserPrinter 4039 12L plus has been tested for software compatibility by IBM for IBM logo software or by the non-IBM software publishers for non-IBM logo software. These tests form the basis for the compatibility results indicated. The testing was done using the currently available version of the software package at the time of testing, or the specific version indicated. Compatibility may not be the same for all versions. Each of the application software products was tested on one or more members of the IBM Personal Computer family. All applications were not tested with every IBM Personal Computer model, but due to compatibility within the IBM Personal Computer family, similar results may be expected for each IBM Personal Computer or Personal System/2 models on which the application operates. Due to the IBM LaserPrinter 4039 12L plus's printing technology, the stationery supplies designed for use with the xerographic copiers should provide satisfactory print quality and feed reliability. Other types of supplies may be suitable for use with the IBM LaserPrinter 4039 12L plus. It is recommended that the users test any particular brand for suitability to their applications. Refer to the IBM LaserPrinter 4039 12L plus User's Guide for complete details on stationery supply specifications. Rough, highly textured, limp, or precurled papers will result in lower print quality and more frequent paper feed failures. Colored papers must be able to withstand 197C (386F) fusing temperature. Preprinted forms and letterheads should be selected using guidelines found in the IBM LaserPrinter 4039 12L plus User's Guide. The chemical process used in preprinting may render some papers unsuitable for use with the IBM LaserPrinter 4039 12L plus. Unsuitable papers include multipart forms and documents, chemically treated papers, coated, synthetic and thermal papers, and preprinted papers requiring high degree of registration. Recycled paper less then 80 g/sqm may cause unacceptable results. All envelopes should be new, unused, and without package damage. Envelopes with excessive curl or twist exceeding 6 mm, those stuck together, those with bent corners or nicked edges, or those that interlock, should not be used. Envelopes less than 220 mm (8.678 in) may experience degraded print or skew when fed automatically. Envelopes made of heavier papers may require use of the front paper exit. Under high humidity conditions (over 65%) the envelopes may be sealed during printing. Many transparencies specifically designed for xerographic copy machines may be used with the IBM LaserPrinter 4039 12L plus. Most labels specifically designed for xerographic copiers or laser printers may be used with the IBM LaserPrinter 4039 12L plus. Labels should be selected using guidelines found in "IBM LaserPrinter Label and Heavyweight Paper Guide" P/N 1058248. Some brands may require manual feeding. The use of vinyl or polyester labels is not recommended. Use of these labels may lead to print quality problems, and may result in damage to your printer. Feeding of card stock from the 200-sheet paper tray is not recommended. Either the manual input paper tray, the optional Envelope+ feeder, or the 100-Sheet Auxiliary feeder must always be installed on the printer to prevent light reaching the print cartridge, which results in degraded print quality. The fuser wiper must be installed in the printer for proper operation and reliable print quality. When attached as an emulated device, full function of the printer is not supported. Functions such as Page Rotation, Font Selection, CPI, LPI, superscript/subscript, and so on may not be supported. Refer to the "Connecting IBM Personal Printers to IBM Systems" manual for attachment information. IBM LaserPrinter 4039 12L plus printable area is limited to within 4.2 mm (0.167 inches) of the top and bottom edge and to within 6.25 mm (0.25 inches) from the left or right edge of the media. Any information placed within this area will not print (except for A4). For A4 paper, the information is adjusted to fit 80 characters per line at 10 characters per inch. The interface selection is made via the IBM LaserPrinter 4039 12L plus operator panel. This interface is used for attachment to a compatible system which supports the same 8 bit interface and commands. This interface is also commonly referred to as Centronics parallel and is capable of receiving data up to 150 K bytes per second. 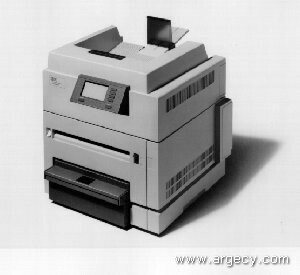 The factory default of the printer is the parallel interface. This interface is used for attachment to an IBM Personal Computer or a non-IBM personal computer which supports the same interface and commands. It is also used for attachment to some systems. DTR/DSR, DTR and XON/XOFF protocols are supported. This interface supports data transmission rates up to 38,400bps. When the serial interface is selected the factory defaults are 9600 bps baud rate, DTR protocol, 8 data bits, and no parity. IBM LaserPrinter 4039 12L plus supports the following LAN interfaces. (1) Can only be installed on an existing 12L after the upgrade kit #6308 is installed. (2) Since there is only one second drawer position, F/C # 5836 and #5830 can not be installed at the same time. (4) Since there are only two memory slots available and one is occupied by the 4MB standard memory, only one additional memory option can be installed without discarding the 4MB standard memory. The second drawer provides an alternate automatic paper feed source. It is installed at the base of the machine. It comes with a 500 sheet letter-size paper tray (5837) or a 500 sheet legal size paper tray (5831). Linking of the primary paper feed and this feature is supported via the front panel and datastream commands. Only one Second Drawer can be installed on the printer. This feature is field installable. Optional paper trays provide customers with ability to have two different sizes or types of stationery available in the printer. The Duplex Option provides the capability to print and collate double-sided pages through the PostScript Level 2 and PCL5 data streams. The Duplex Option comes with a 14" special paper tray that allows duplexing from the standard paper tray location. Due to the design of this tray, input paper capacity is reduced to 300 sheets. This feature is portable and interchangable with other IBM LaserPrinter 4039 12L plus. Simplifies the process of changing from one type paper to another. Rather than removing the paper from the tray in use and replacing it with another type paper, a simple change of paper trays accomplishes the task. Flash memory provides the ability to store download fonts and macros, and change the contents as needed. Since there is only one slot available for these features, only one of the features can be installed at a time. Each card contains the more popular fonts for the application indicated, i.e. Publications (#9153), 25 fonts, Presentations (#9154), 26 fonts, and Wordprocessing (#9155), 26 fonts. Envelope+ Feeder is installed in the back of the machine, in place of the manual input tray. It allows the customer to automatically feed envelopes to be printed. Its capacity is approximately 75 envelopes of 75 g/sqm (20 lb) stock. In relative humidity of 65% or higher, envelope flaps may seal. Manual input tray must be removed if Envelope Feeder is used. Only one Envelope+ Feeder can be installed on the printer. The Envelope+ Feeder and the Auxiliary Feeder are mutually exclusive of each other. The Auxiliary Feeder is installed in the back of the machine, in place of the manual input tray. It provides the customer an additional paper source to the standard tray or the second drawer. It is capable of feeding paper and transparencies. Its capacity is approximately 100 sheets of 75 g/sqm (20 lb) stock. Manual input tray must be removed if Auxiliary feeder is used. Only one Auxiliary Feeder can be installed on the printer. The Auxiliary Feeder and the Envelope+ Feeder are mutually exclusive of each other. Memory Options extend IBM LaserPrinter 4039 12L plus user memory. Since there are only two slots available for memory, only two memory cards can be installed at a time. The two available slots include the slot occupied by what has been described as standard for the IBM LaserPrinter 4039 12L plus. The Integrated Network Option directly attaches the printer to Token-Ring or Ethernet Local Area Networks, using Novell NetWare, AIX OS/2* Lan Server, or Microsoft LAN Manager operating systems. The LocalTalk Network Option directly attaches the printer to Apple computers or an Apple AppleTalk network. These contain additional protocol support for Windows NT and Apple EtherTalk/TokenTalk**. These features are field installable.